The former U.S. CTO explains why innovators should include the perspectives of patients, clinicians and patients when building apps. 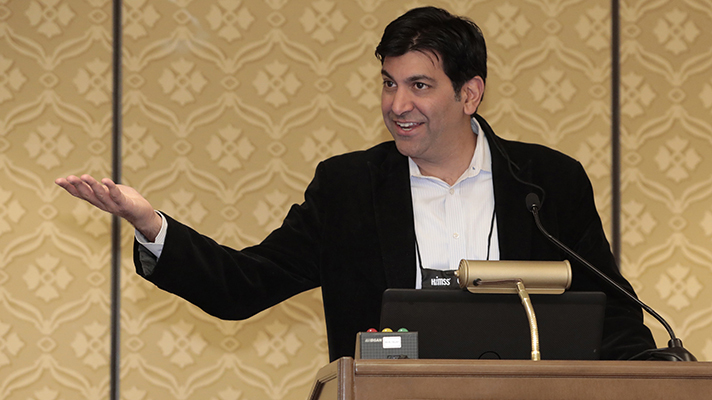 Aneesh Chopra said that the healthcare industry needs to start looking at privacy and ethics, especially in the midst of recent Cambridge Analytics and Facebook problems. Part of the oath includes bringing in three perspectives: patient, providers and payers. Patients with chronic conditions are eligible for certain services, but there are many applications competing to be the one that patients download. To catch on, Chopra suggested that developers focus on making them consumer driven and easy to use. As for doctors, it's important that using the new innovation isn’t a chore, Chopra said; the goal is to increase effectiveness and decrease physician burden. Meanwhile, on the employer payer and ACO side, it is important for these stakeholders to get the information they need. That’s because innovation isn’t a solitary pursuit — it can take a lot of minds coming together to develop products and get them into the right hands. In fact, joining forces for innovation is one of the missions former U.S. CTO Aneesh Chopra has advocated over the course of his career. “We need all hands on deck from the developer community to accelerate the pace of application development for doctors, care teams and patients,” Chopra said. During his tenure as US CTO, Chopra worked to open up government data to the public and encouraging innovators and researchers to use the information to help drive healthcare development has been a key message for Chopra. “We, the country, have been working to open up medical records and have this treasure trove, but it is up to developers to work hand and glove with patients to ensure applications they build delight those stakeholders,” Chopra said. Chopra highlighted some of the public and private partnerships, specifically giving newly deployed Lighthouse — an open API that allows developers to create digital technology to build mobile and web app services for veterans — as an example. The new technology, which was displayed at HIMSS18, outlines four approaches for developers: standards-based, data-driven, future-proof, and veteran-centric technology. While the API isn’t specifically focused on healthcare, it is expected to target some issues within the Department of Veterans Affairs' health systems.